12 for the price of 10! 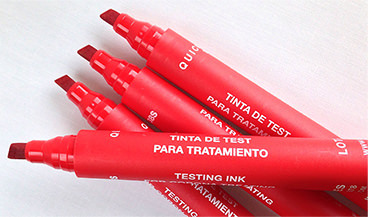 The Quicktest 38®S test pen is a printability check for the treatment of plastics, such as polypropylene, polyethylene and polybutylene. A testpen stroke leaves a full line on the material if the material’s surface energy has a value of about 38 dyne/cm or more. If, however, the surface energy is lower than 38 dyne/cm, then the pen marking will form into small droplets. This ink dries within seconds of application leaving a permanent image of the result for proof of results. Our other inks don’t have this drying capability.